Statistics from the 2016 Global Education Monitoring Report show that Nigeria is the largest country in Africa in terms of population, and has approximately 20% of the total out–of–school children population in the world. With nearly 11,000 newborns born every day in Nigeria, the system capacity to deliver quality early childhood education programs places an even larger burden for primary school preparation and better educational outcomes. Dedicated to the principles of equal educational opportunity and social inclusion, HIPPY – Home Instruction for Parents of Preschool Youngsters – works with communities and families worldwide who face socio-economic challenges, helping parents and caregivers to prepare their children for school, motivating them to reach their highest potential. Through HIPPY, home visitors role-play with parents and provide them with a carefully developed curriculum consisting of books and materials designed to strengthen young children's cognitive and early literacy skills. HIPPY also facilitates the physical and social/emotional development of young children. “After several attempts to start a HIPPY program in Nigeria, I was delighted when Ruby offered to take the step of visiting and sharing her experience with and passion for HIPPY. No doubts her efforts will bring us a little closer to our goal of setting up a pilot program there,” said Dr. Miriam Westheimer, Director of HIPPY International. Ms. Joseph’s visit stemmed from initial travels to Nigeria in 2015 when she joined Florida HIPPY state office staff and a team of university business students who piloted using phones to the deliver the HIPPY curriculum in communities in Lagos, Nigeria. 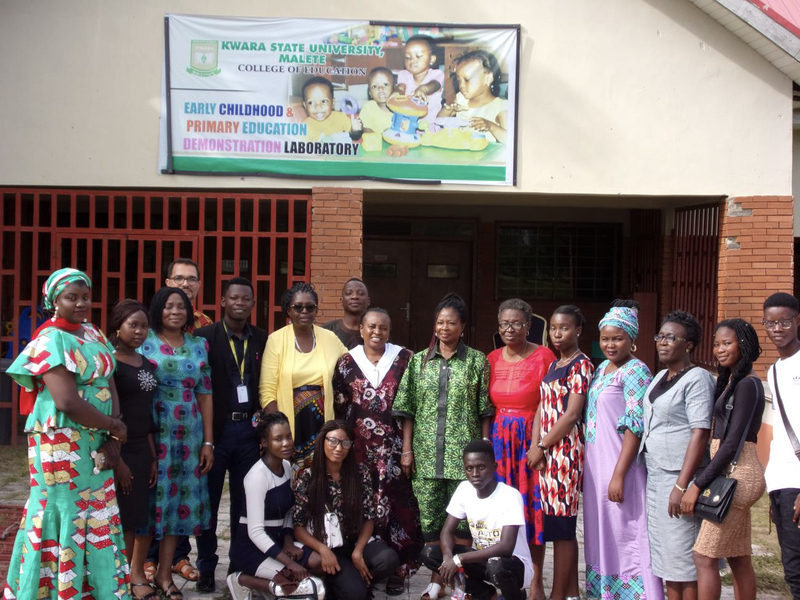 She met Dr. Temitayo Ogunsanwo, Head of the Department of Early Childhood and Primary Education at Kwara State University (KWASU) who became interested in learning more about how the HIPPY curriculum could be implemented into communities near her university. Continued communication and discussions between Dr. Ogunsanwo, Ms. Joseph, and Dr. Miriam Westheimer, Director, HIPPY International, resulted in Ms. Joseph’s most recent visit. During this visit Dr. Ogunsanwo helped arrange several orientations, training and/or planning meetings with various stakeholders, including: KWASU Vice Chancellor; Provost, College of Education; KWASU faculty and students from the Department of Early Childhood and Primary Education; potential business funders; community leaders; and families. During the meetings, Ms. Joseph provided overviews of the HIPPY service delivery model, and shared research and evaluation results of HIPPY’s impact on child and family outcomes. She also provided a brief orientation about USF strategic goals of expanding global collaborations and contributing to global scholarship through university partnerships. Now back in Tampa, Ruby will continue working with HIPPY International, and her colleagues in Nigeria to develop of an action plan of next steps to secure funding for a HIPPY service project, outline logistics related to the pending research project. Dr. Ogunsanwo and her staff will continue to work with HIPPY International as they continue to create more awareness about HIPPY among families, communities and business leaders. “CFS is happy to support Ruby and HIPPY International in their efforts to pilot and implement school readiness programs throughout the world and ultimately bring about better educational outcomes for children in Nigeria and other parts of the world,” said Dr. Mario Hernandez, Chair of the USF Department of Child & Family Studies. For additional information on her travels to Nigeria or the HIPPY Program, contact Ruby. L to R- KWASU driver, Kayode Ezekiel Obafemi (Asst. lecturer, KWASU), Ruby Joseph, (Faculty, USF); Adegoke Oladipo Olaniyan Asst. lecturer, KWASU), and Temitayo Ogunsanwo, (Head of Department of Early Childhood and Primary Education, KWASU). Faculty, staff and students after a 3-hour Skype training provided by USF and HIPPY International, Inc.
Joseph explaining the HIPPY program to a group of community residents in Malete village. USF and KWASU faculty and staff meet with Professor Abdul Rasheed Na'Allah , (KWASU Vice Chancellor) to discuss proposed HIPPY research project. USF and KWASU faculty with villagers at Elemere community meeting where families receive information on the HIPPY research project that will provide free, early education services to children in the community.